Well, this one came out of nowhere. “Wind-based platformer” sums it up pretty aptly. Really though, it’s got Legend of Zelda: Wind Waker looks and Skyward Sword (at least, the interesting parts) flair. 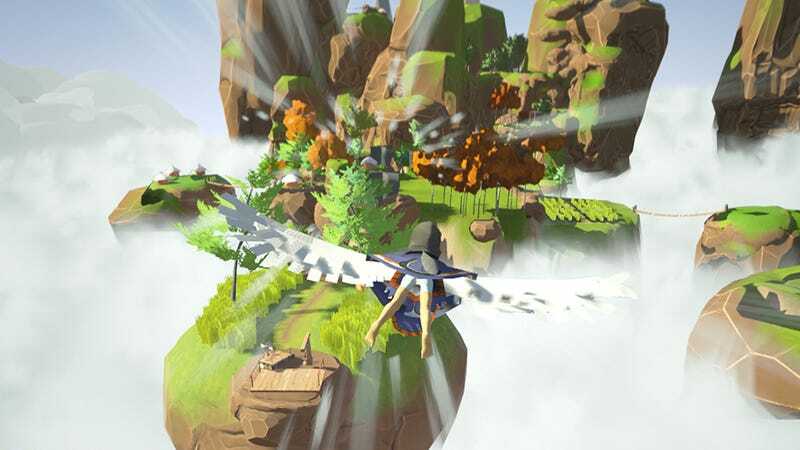 You soar around solving wind-based puzzles to collect feathers from a bird so big it could eat Big Bird and still have room for a second, even bigger bird. It is probably all about that sweet Big Bird Turducken. Clouds Below is, in its current state, more a proof of concept than anything. Its small Swedish dev team released it after only seven weeks of development, so it’s a little janky. Jumping and flight, for instance, could feel a lot better. But again, this game was only a hatchling of an idea a couple months ago. Given that, the bit that’s already playable flies pretty damn high. Based on general response to the prototype, the developers are hoping to decide whether or not they’ll continue making the game. I don’t know about you, but I’d certainly like to explore more of this wind-powered bird person paradise.